Shelley Bean: Finally...the winners. And Pajama Party results! Cute card, I really like the inside. I am now a follower. Happy 21st to your son! That is a cute "hog" for sure. I like how you did the inside too. I love the idea of doing 10 reasons-- my grandkids would love it! Your top ten list cracks me up and I just love that little hedgehog cut. TFS and thanks for the chance to win your very pretty digistamp. New follower and I'd love it if you were to follow me too. Hurray for February birthdays! Love your card and your description on how and why you made it is great! I am a new follower and I will be back! Please visit my blog to see why I love February! Tonight I participated in a really fun Pajama party over at Paper Patch Crafts. It was a blast! Anne had challenges and games to play and despite problems with facebook we had a lot of fun. There were 3 card challenges that I participated in and I thought I would share them with you here tonight. There is plans to continue the party again tomorrow so I encourage everyone to go and join in on the fun over at the Patch! 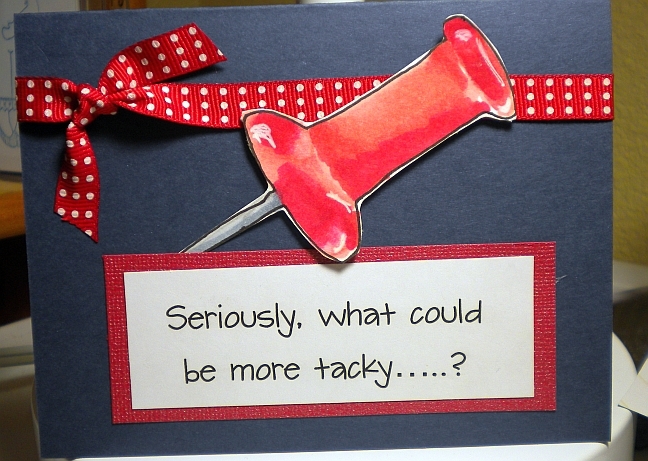 The first card was Easter themed. We were encouraged to use pastel colors and include a chick, egg or bunny. I opted for the bunny. 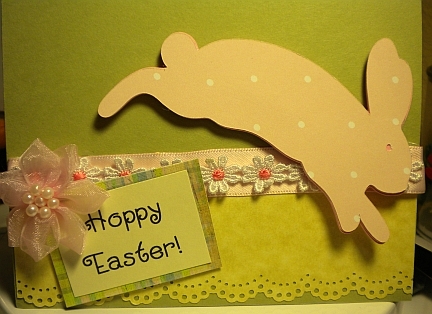 I used the Easter 2010 cartridge for Cricut and cut out 4 exact copies of the bunny on heavy cardstock. I then layered them together to create a faux chipboard effect. 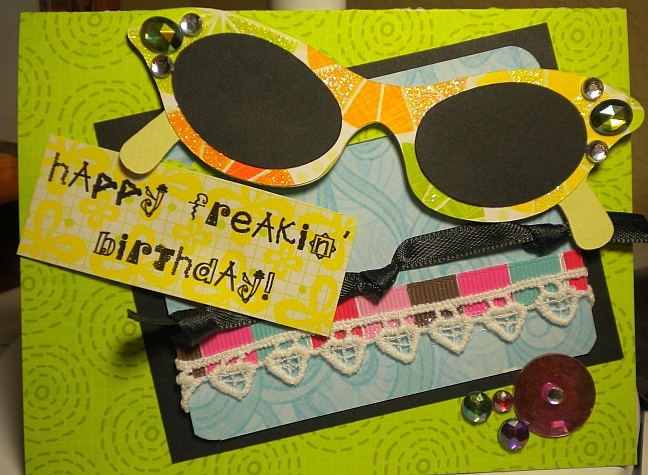 The 2nd card had a theme that was: Wacky, Tacky and Weird. Oh my gosh...you should have seen some of the hilarity that ensued! I was laughing so hard. I myself couldn't think of anything that clever and so decided to take a literal approach. I free-handed a thumb tack and then colored it in with my copic markers. The rest is pretty much self-explanatory! I used the Forever Young Cartridge for the glasses. They look similar to ones my mom used to wear in the late 60's...unbelievably...hers were orange though! !